Home / Indoor Furniture and Misc / Shaker Style Collection Indoor Furniture Woodworking Plans for Projects / Shaker Nightstand Woodworking Plan. 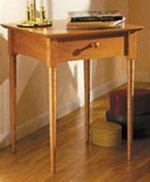 31-MD-00254 - Shaker Nightstand Woodworking Plan. Wood and/or Supplies needed: We used cherry and plywood, but you can use a wood of your choice, A full materials and supplies list are included with the plan. Shaker Cheval Mirror Woodworking Plan.